On October 31, 1994 at 1559 Central Standard Time, an Avions de Transport Regional, Model 72-212 (ATR-72), registration number N401AM, crashed during descent after uncommanded roll excursions and a loss of control. 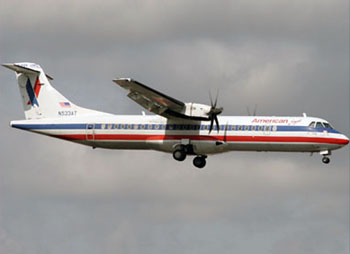 The aircraft was leased to and operated by Simmons Airlines, Incorporated, and doing business as American Eagle Flight 4184. Prior to the approach into Chicago, Illinois (ORD), the airplane was in a holding pattern in icing conditions, and it was descending with the autopilot engaged to a newly assigned altitude of 8,000 feet when an uncommanded roll excursion occurred. The initial roll excursion and subsequent loss of control were precipitated by an airflow separation forward of the ailerons and uncommanded aileron deflection resulting from an aileron hinge moment anomaly. The airplane was destroyed by impact forces, and the flight crew of four (captain, first officer and two flight attendants) and 64 passengers received fatal injuries.